Mini-Muffin Mania--try to say that one three times fast. I feel like we are in the midst of that in our house. Do your children go through eating phases like mine? A couple years ago, my son went through a pancake phase where every day he asked for pancakes. Now, if I say I'll make pancakes, he'll say how about some cereal. Really? I'm offering you sweet bread topped with butter and syrup and you just want cereal? Well, currently the new request is chocolate muffins; that is ever since I first made the Fudgy Chocolate Banana Flax Muffins by Daphne Oz. I actually don't mind making them at all; for two reasons. First of all, in-case I haven't said this before I have a sweet tooth and I LOVE muffins and second of all, they are actually pretty healthy. I know what you're thinking, if they are healthy, they probably taste healthy too. The truth is they taste a little healthy, but I think they're still pretty darn good. I first heard about these muffins from my teaching assistant. Let me start by saying she's the most fabulous kindergarten assistant that probably ever lived. She always knows just what we need to do, sometimes even before I know. She certainly keeps me on track! (Not that I ever get off track, hah). But anyway she's always looking up healthy recipes and cooking with lots more vegetables than I usually cook with. And the good news is that if she has a lot leftover, she usually shares. A few months ago she made some chocolate muffins and brought me a couple mini-sized muffins to sample. I thought they were pretty good, so of course she shared the recipe (and enough coconut oil to make two batches). I told you she's wonderful! The recipe is found in Daphne Oz's cookbook entitled Relish, which I have enjoyed perusing as well. Back to the muffins, so today was yet another snow day in my area, which means another day as a stay-at-home mom for me, but with full pay (definitely a teacher job perk). Although we might be going to school until July at this rate (just kidding, that's never happened). But of course today's breakfast request was in fact the "chocolate muffins". Sure, twist my arm. I will issue one warning about these muffins before I tell you how to make them; they require a lot of "specialty" ingredients. I had to make a special trip to the store for some of them, namely coconut oil, flaxseed and wheat germ, but if you're into cooking healthy, you may already have these items in your house. You also need 4 extremely ripe bananas and the coconut oil. I got a little ahead of myself and started making the muffins before I decided to write about them. Oops! First cream together 1/2 cup melted coconut oil and 1/4 cup light brown sugar (that's all the sugar in the muffins, seriously). Next add 4 medium overripe bananas, 2 tablespoons unsweetened applesauce, 1 teaspoon of pure vanilla extract, 1/4 cup of water, and 2 large eggs. Next, in a separate bowl whisk together 1 1/2 cups whole-wheat flour, 1/4 cup cocoa powder, 1/2 cup wheat germ, 2 tablespoons of ground flaxseed, 1 1/2 teaspoon baking soda and 1/2 teaspoon salt. Next, you mix the dry and wet ingredients together. The actual recipe says to put the wet into the dry and I put the dry into the wet. I'm a rebel like that. Perhaps they would have turned out even better if I had followed the directions to a T? I thought they were fine, however, and my beaters were already in the wet mixture if that makes sense. I'm all about convenience. I also didn't premash my bananas, I just tossed them in the bowl and let the beaters mash them, so you'll see a few chunks of banana in some of the pictures. After you get the two mixtures fully combined you fold in 1/3 cup of chopped semisweet chocolate chips. I don't know how this happened, but I was completely out of chocolate chips this morning so I had to resort to chopping up a dark chocolate bar. Here is what the finished muffin batter looks like. Note: the consistency is a little thicker than your typical muffin mix, but it really does taste good. Now you'll want to preheat your oven to 350. Whoever decided to put the preheating at the beginning of making a recipe obviously did not have small children. I can never manage to get the batter made and into the pan before my oven is preheated. NEVER! If you can, you are awesome, please tell me what I'm doing wrong. The recipe says to put the batter into muffin liners, but I did that the first time I made them and when you peeled away the liner, half of the muffin bottom went with it. Plus I feel like muffin liners are a little bit of a waste unless you are giving the muffins to someone else. Therefore, this time I sprayed my muffin pan with Pam and just plopped the batter in with a cookie scooper. I used a mini-muffin pan because I have small kiddos and they tend to sometimes waste whole muffins. Mini-muffins are perfect because if they only want a little they can eat one or two or if they want a lot, they can eat more. Plus, I feel much less guilty popping those little guys into my mouth rather than chowing down on a full-sized muffin. After the oven is preheated, bake your muffins for 12-15 minutes. The recipe mentions that you should test them with a toothpick and that there should be a few crumbs on the toothpick when they are finished. Mine were perfect at 12 minutes. The recipe also says to let them cool for 5 minutes on a cooling rack before eating. Good luck with that! 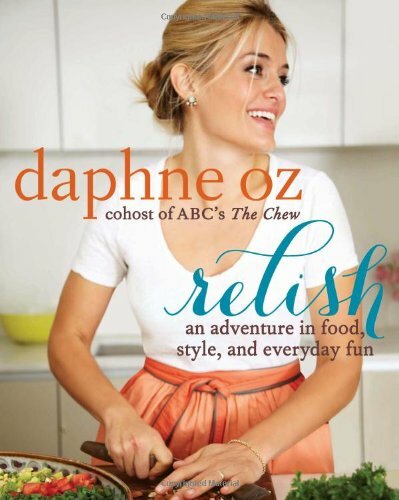 If you like this recipe and you want to try more by Daphne Oz, check out her cookbook Relish. If you like healthy eating, you won't be disappointed, I promise.